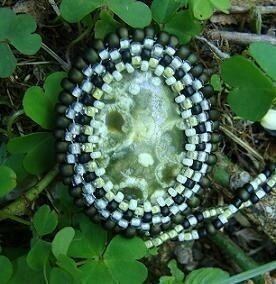 Here you will find a two part video series on how to do the tubular peyote stitch around a cabochon. In the videos I used a cabochon and beads with a lot of contrast to make it easier for you to see how to do the stitch. It isn't my favorite cab or color combo but it does show up better on film. Give a try. Peyote is fast bead work once you get the hang of it.